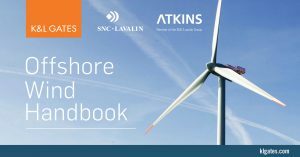 K&L Gates LLP, and Atkins, a member of the SNC-Lavalin Group recently released an Offshore Wind Market Handbook to help guide investors through technical- and regulatory issues in the emerging US offshore wind market. Regulatory issues include a discussion of the interplay between US federal jurisdiction and the various coastal states that have enacted laws and regulations encouraging offshore wind projects. Technical issues include turbine and foundation options and solutions, performance assurance strategies and a discussion of innovations in design and equipment that are particularly suited to US coastal waters. The K&L Gates renewable energy practice combines European project experience with US regulatory and project development expertise. Atkins is a leading provider of full range technical and operational expertise in the energy industry, including engineering design and owner’s engineer services in the global offshore wind market. Together, K&L Gates and Atkins demonstrate market leadership on key issues and can help investors build a leading position in the US offshore wind market. The tumultuous 2018 midterm election, characterized by many as the most consequential in a generation, ended as predicted: the Democrats took control of the House while the Republicans increased their hold in the Senate. Indeed, it was a tale of two Houses. As of 10:00 a.m. ET on November 7, the Democrats have picked up 28 seats in the House of Representatives, with the prospects of gaining about seven more as the remaining close races are decided, mostly in the west. In the Senate, Democratic Senators in Missouri, Indiana, and North Dakota were defeated while a Republican lost in Nevada, resulting in a net gain of two Senate seats thus far for Republicans with three races too close to call. To help you assess yesterday’s election, K&L Gates has prepared a comprehensive guide that summarizes the results and their impact on the 116th Congress, which will convene in January. The Election Guide lists all new members elected to Congress, updates the congressional delegations for each state, and provides a starting point for analyzing the coming changes to the House and Senate committees. Please click here to download the most up-to-date version of the 148-page Election Guide, which will be updated on an ongoing basis as more of the close races are called and committees are finalized. For additional information regarding the effects of the recent elections, please contact Tim Peckinpaugh or any member of the Public Policy and Law practice. To view the complete guide online, click here. To view more information on theses topics in Volume 37 of the Blockchain Energizer, click here. On October 16, 2018, the Federal Energy Regulatory Commission (“FERC” or “the Commission”) issued an order (“Order”) that dramatically reforms the way it determines the just and reasonable return on equity (“ROE”) in rate cases. The new methodology abandons FERC’s exclusive reliance on its discounted cash flow (“DCF”) model and will now give equal weight to the DCF, capital-asset pricing model analysis (“CAPM”), and an expected earnings analysis (“Expected Earnings”) to determine if a ROE is unjust and unreasonable. FERC will add a fourth method, a risk premium analysis (“Risk Premium”), to determine the new ROE when it finds a challenged ROE unjust and unreasonable. While the new method only applies to transmission owners in New England, considering FERC’s enthusiasm for uniformity, the policy will likely be applied to more rate cases in the future and could impact both the electric and gas industries. The Order on remand, from the DC Circuit Court of Appeals in Emera Maine v. FERC, 854 F.3d 9 (D.C. Cir. 2017), comes as the latest iteration of cases based on several complaints against the collective ROE of the transmission owners in ISO New England, Inc. The ROE represents the allowed return on utility equity included their cost-of-service rates. Under the famous Hope and Bluefield standards, FERC must set utility rates and returns on investment commensurate with other enterprises of comparable risk and sufficient to attract capital and “assure confidence in the financial integrity of the enterprise . . . .” FERC ratemaking also “involves a balancing of the investor and the consumer interests.” FPC v. Hope Nat. Gas Co., 320 U.S. 591, 603 (1944). In these cases, FERC was called upon to address a challenge to the New England transmission owners’ ROE under Section 206 of the Federal Power Act (“FPA”). Under Section 206, FERC first determines if the existing allowed ROE is “unjust and unreasonable.” If that first finding is made, it then must establish a new just and reasonable ROE to replace the existing rate. For nearly 40 years, FERC used the DCF method to assess whether a ROE is just and reasonable for a public utility. Under the DCF method, FERC evaluates the expected dividend growth and market-determined yields of a group of comparable utilities with bond ratings the same as or close to the utility or utilities subject to the ROE complaint to generate a range of ROEs with an upper and lower bound, which FERC termed the “zone of reasonableness.” FERC then identifies a point in that range as the just and reasonable ROE. FERC had been using the midpoint (for multiple utility ROEs) or median (for a single utility) until recently. In early stages of this case, it began looking at various other considerations to adjust the ROE upward. FERC essentially used the new ROE to satisfy both findings it must make under Section 206 of the FPA. The Court of Appeals ruled that FERC must explicitly find that a ROE is unjust and unreasonable before it can establish a new rate. It was not sufficient for FERC to find that the new ROE it establishes under the DCF method differs from the existing ROE. Rather, the court held that a broad range of ROEs could be just and reasonable under the FPA (although this range was not the same as FERC develops under the DCF method) and that FERC must find that the existing ROE is not in this range before it establishes a new one. FERC declared an end to its sole use of the DCF model to determine whether a ROE is just and reasonable. Instead, it will use the DCF with two other methodologies (CAPM and Expected Earnings) to determine whether a utility’s ROE falls within the zone of reasonableness. If it finds that it does not, it will then use these three methodologies plus a fourth, Risk Premium, to establish a new rate. FERC chose to incorporate the CAPM, Expected Earnings, and Risk Premium methodologies because, among other reasons, “investors use those models . . . to inform their investment decisions.” The basics of each methodology are worth understanding. The CAPM evaluates risk and cost equity through a formula that adds a “risk-free rate” with a “market-risk premium,” multiplied by a “beta” of the security. The risk-free rate is a proxy number, often based on the yield of 30-year U.S. Treasury bonds. The beta is a measure of the stock’s risk compared to the market. The market risk premium is the difference between the risk-free rate and the expected return on that stock, which is found either by forward-looking estimates, backwards-looking estimates, or a review of investment academics’ and professionals’ estimates. The Expected Earnings methodology determines the earnings an investor can expect to receive on the book value (the equity of a company’s capital minus the long-term debt) of a particular stock. The analysis either uses backwards-looking estimates, based on historical earnings on book value, or forward-looking estimates based on analysts’ forecasts of the company. The value of expected earnings helps investors gauge the opportunity cost of investing in a specific utility. To assess the first prong of the FPA’s Section 206 standard, three of the methodologies (DCF, CAPM, and Expected Earnings) will yield a composite zone of reasonableness from which a spread of presumptively just and reasonable ROEs for utilities with comparable risk profiles will be identified. FERC will establish an overall zone of reasonableness, then subdivide that zone into four “quartiles” centered on the overall midpoint, and upper and lower midpoints of the zone. FERC will use the overall midpoint and upper and lower midpoints to anchor three zones of reasonableness, one each for utilities of lower risk, average risk and higher risk utilities. If the subject utility falls with its appropriate zone, FERC will presume that it is just and reasonable. If not, FERC will move on to set a new just and reasonable rate. For comparison to average risk utilities, the central tendency of DCF, CAPM, and Expected Earnings zones of reasonableness will determine the cost of equity. Those three midpoint/median figures will be averaged along with the Risk Premium number to calculate the ROE of average risk utilities. To assess ROEs for below or above average risk utilities, the midpoint/medians of the lower and upper halves of the zone of reasonableness will be used, respectively. FERC will continue to determine a utility’s risk profile by two means. First, it compares the utility to a proxy group of companies with similar risk profiles, i.e., utilities within one “notch” of the subject utility’s credit rating. Second, FERC eliminates utilities from the proxy group based on specific circumstances may be unique, such as involvement in a merger or unusually high or low ROEs found under the four methodologies. Additionally, FERC will use a “composite zone of reasonableness” based on the DCF, CAPM, and Expected Earnings to create a limit to a utility’s total ROE (base ROE plus incentives). Using this composite zone, FERC will dismiss complaints against ROEs that are within that zone, which are seen as presumptively just and reasonable ROEs, unless that presumption is adequately rebutted. The new calculation for ROEs is considered favorable for public utilities. Under the new calculation, there will be less need to account for anomalous market conditions because four distinct methodologies are used. The calculation is expected to identify a more accurate and healthy ROE for utility investors infrastructure investment. Currently, the new method only applies to the litigation over the ROE for the New England transmission owners. However, given FERC’s desire for uniformity, the future policy could eventually be applied to all rate cases for electric utilities and gas pipelines subject to FERC’s jurisdiction. Please Join K&L Gates and use our Speaker Discount Code! 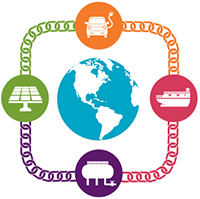 Join K&L Gates’ Buck B. Endemann and Benjamin L. Tejblum, along with an expert panel in New Orleans, LA for a two-day conference that will discuss the business use cases of blockchain technology within the energy industry, cutting through the hype to focus on realistic applications of blockchain that many companies are already integrating. Diverse content experts will present actual data, case studies and pilot projects involving blockchain to showcase what this technology can actually do for energy companies, while evaluating the longer-term implications for business and blockchain’s relationship to the evolving electric grid and other emerging technologies. This program will maintain an objective perspective of blockchain, addressing concerns about the technology, and evaluating if it is actually appropriate for every application it is being looked at for. K&L Gates is pleased to offer a registration discount to colleagues and friends of the firm. Simply enter discount code BLOCK18SPK when registering. Significant investment is flowing into private companies seeking long-sought-after breakthroughs to develop practical power generation solutions based on nuclear fusion reactions. Fusion reactions have become relatively commonplace in the laboratory setting, but no one has developed a nuclear fusion reactor yet that produces more energy than the device uses to operate and maintain the reaction. Numerous private companies, in the United States and around the world, are attacking this challenge with a variety of approaches, with the goal of making the technology sustainable, practical, and commercial. These companies are receiving significant investment from backers who believe a solution is within reach.